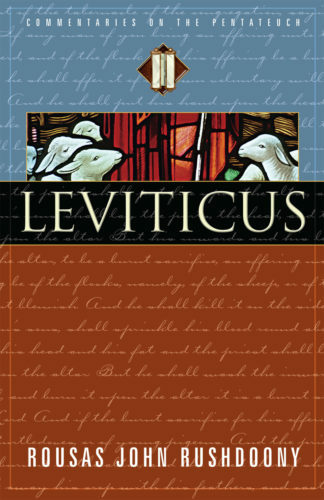 The book of Leviticus has not been a popular subject of study in the modern church. Much like the book of Proverbs, any emphasis upon the practical applications of God's law is readily shunned in pursuit of more "spiritual" studies. Books like Leviticus are considered dull, overbearing, and irrelevant. To be spiritual, in the modern sense of the term, means to live on a "higher" level where today's Christian is governed more by the impressions of the heart than a carnal commandment. But man was created in God's image and is duty-bound to develop the implications of that image by obedience to God's law. In this volume, the author writes, "Man cannot develop his personhood except in terms of God and His law-word. Even as God separated man from the dust of the earth to make him a living soul (Gen. 2:7), so God summons covenant man in Leviticus to separate himself to the Covenant Lord and to become holy even as God Himself is holy. The law or justice of God is the way of holiness." The book of Leviticus contains over ninety references to the word holy. The purpose, therefore, of this third book of the Pentateuch is to demonstrate the legal foundation of holiness in the totality of our lives. In the book of Zechariah, the prophet proclaims a day when "there shall be upon the bells of the horses, HOLINESS TO THE LORD" (Zech. 14:20). This same inscription is borne upon the garments of the high priest, and pictures for us a day in which every area of life shall be made holy to the Lord. This present study is dedicated to equipping His church for that redemptive mission.